HOORAY, all of the semi-boring challenge days are over! Now comes the REALLY hard part - complicated themes! Black and white isn't exactly complicated, but it opened me up to a lot more possibilities than the single colors. 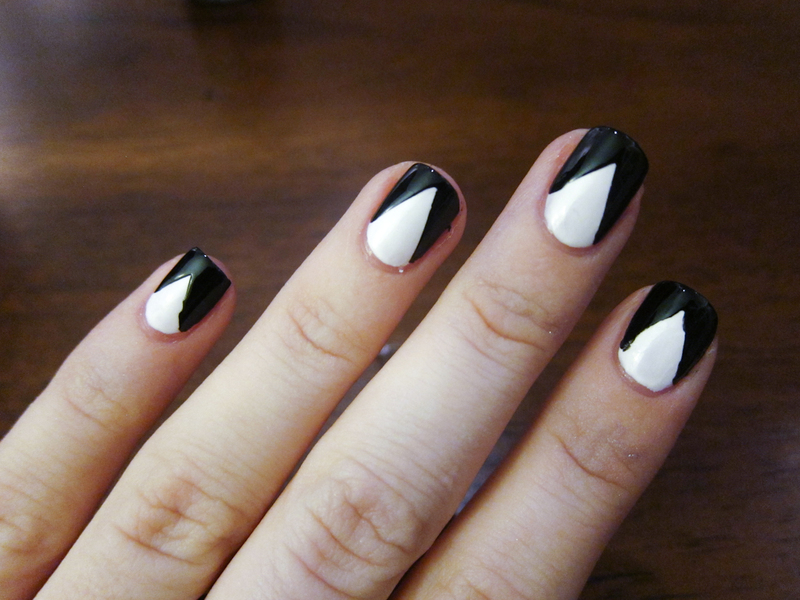 I was thinking about things that were black and white and would translate to a cool mani. I had a brainstorm! TUXEDOS! Now, I realized later that I am not the first to come up with and/or execute this idea. However, I am the coolest. Sorry, everyone else. So, here is the James Bond mani. For this one, I used China Glaze Liquid Leather and China Glaze White On White. STEP ONE: Paint your nails white! LET THEM DRY. I used a coat of Seche Vite to speed up the process. STEP TWO: Stick some tape to your leg or to the palm of your hand. You want to do this so you get rid of some of the intense stickiness that it will be harboring. You don't want it to pull up your polish! Take the tape off and cut it into little pointies. 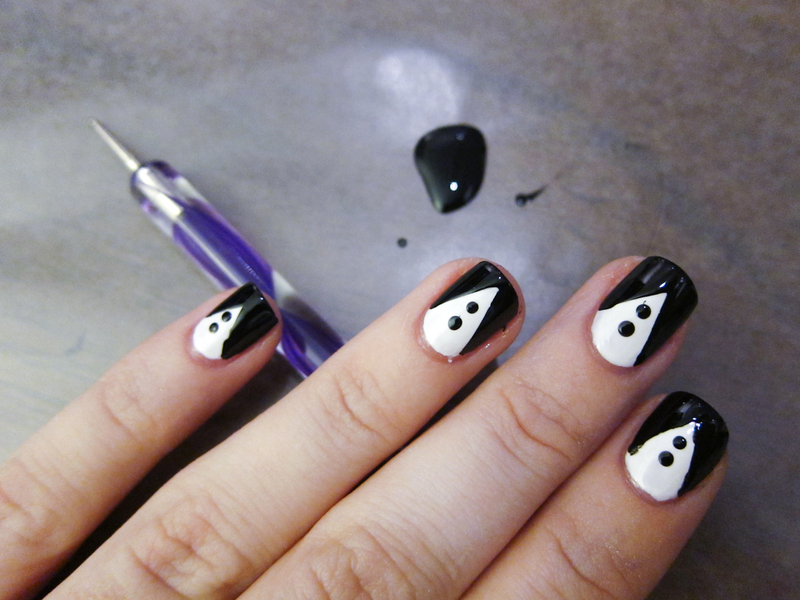 STEP THREE: Stick the pointies to your nails where you want the white to remain. The tape is going to block out all the black polish! Stick all of the tape to all 5 fingers before you start painting the black. Try to make sure your tape edges are down flat on the nail all the way around. STEP FOUR: Paint the black on over the whole nail. 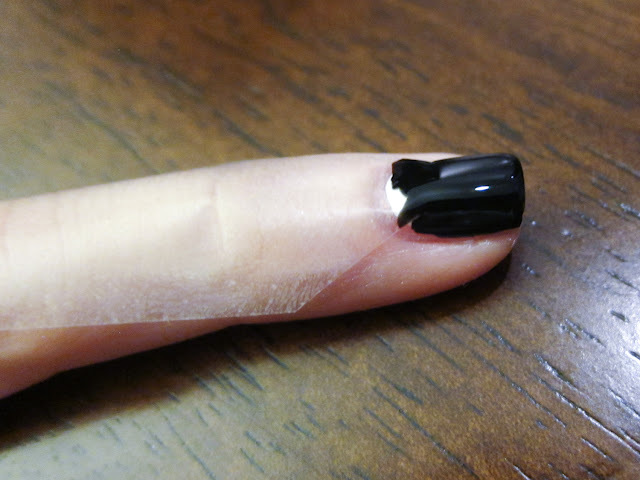 STEP FIVE: Slowly, and I mean SLOWLYYYYYY, peel the tape off of your nail. Discard. I had a few uncooperative fingers. STEP SIX: Add two (or you can do part of the bowtie now and add three) dots for the buttons on your tuxedo shirt. I like to make a little tiny pool of polish on some wax paper for easy access with my dotting tool. STEP EIGHT: LET IT DRY FOR A BIT BEFORE YOU SECHE VITE IT! If you don't, you can get little smears from the bows, like I may or may not have ended up with. Once it dries a bit, then you can add your fastdry topcoat of choice. Ta-da! 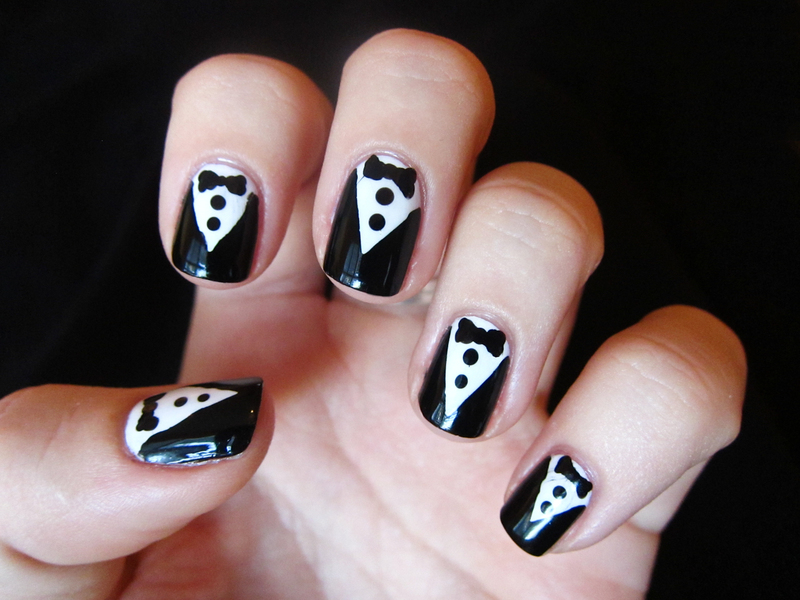 The ultimate classy manicure. It's like I've got ten little James Bonds on all my fingers. Not gonna lie, I feel like a badass. 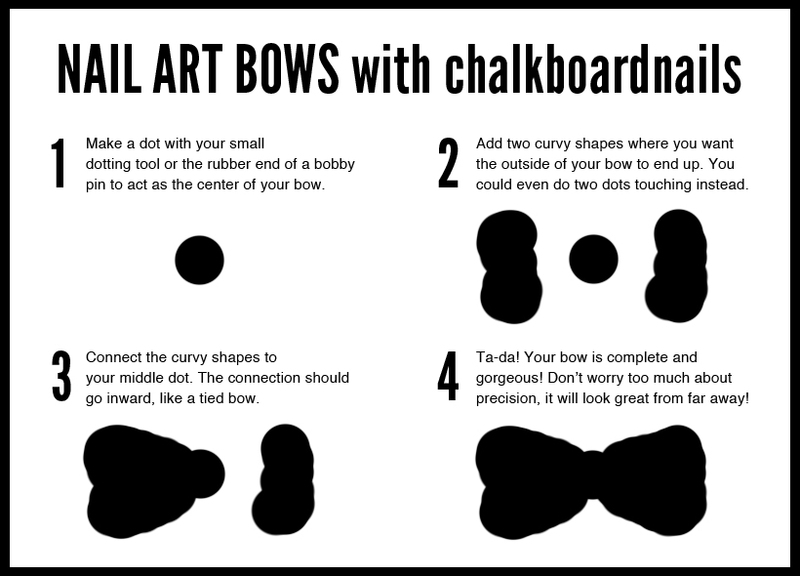 Hope you like, and feel free to share this tutorial (linking back to me, of course... ;] )! STOP IT RIGHT NOW WITH THE CUTE!! I just died a lot a bit! Hahah thank you! This is a super easy mani, just takes a little chunk of time. Everyone can do it! this mani for the challenge is super cute!!! could you imagine a bride having this mani for her wedding day?!! lol!! What a geat tutorial. Sadly, I don't have a steady hand to do something like this. This is so amazing! Definitely giving this a go! 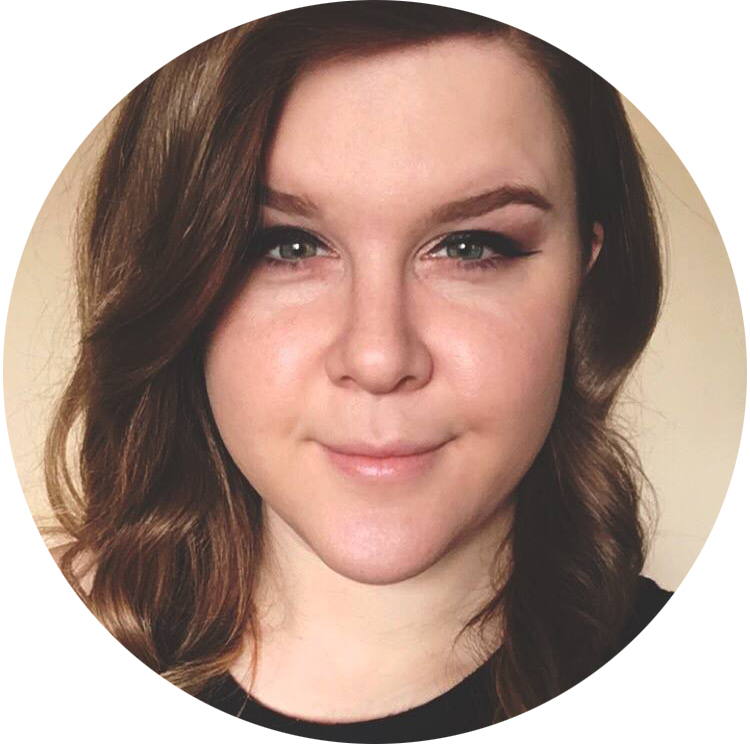 Hello Sarah! :D I just want to let you know that i loved this manicure soooooo much that i got inspiration from it to do a weekly chalenge - Monkey see, monkey do lol (where we pick inspiration from fellow bloggers :)). 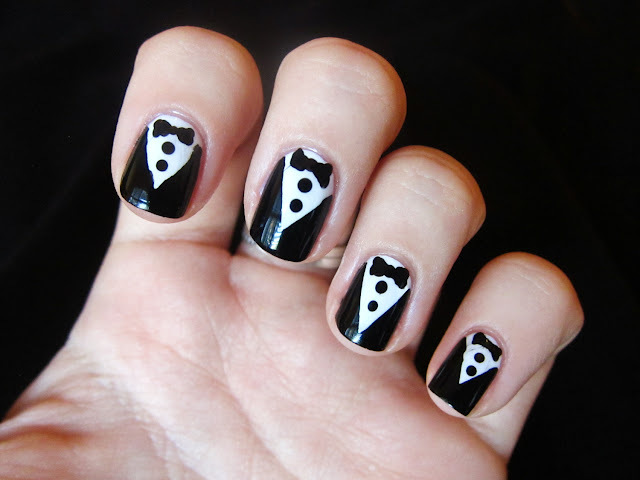 Here's the link if you want to check it out lol: http://theclockwisenailpolish.blogspot.pt/2012/05/monkey-see-monkey-do-tuxedo-nails.html? Do u peel th tape off when the black polish has dried or still wet? Remove the tape while the polish is still wet.